We all know that stress is a natural part of life – and a little bit of stress can even be a good thing (like when we really hope that a first date goes well, or that thrill we get on a rollercoaster!). But when stress gets to be overbearing, it can have debilitating effects on our health, relationships and behavior. The same is true for our dogs. If Fido is overly anxious in new situations or when left alone, reactive with people or other dogs, having severe fear reactions to new situations/objects/noises, withdrawing, or developing frequent side effect behaviors like barking and chewing inappropriate items, the culprit is most likely too much stress. While many dogs do these things occasionally (we all get a little stressed sometimes), if they are how your dog operates on the regular this indicates an unhealthy level of stress. It’s important we help him get his stress level under control or it will just have worse effects over time (for both of you). In a society strongly focused on Western medicine, it’s common to try to treat the symptoms of stress with medication. Many veterinarians will prescribe Prozac, Xanax or Valium, as this is what they are taught in veterinary school. Sadly however, relying on medication does not address the cause of your dog’s stress – and putting your dog on medication long-term can actually ADD to his stress level by causing his liver to work overtime (his adrenals are already overworked with such a high level of stress). While there are times when the temporary use of medication can provide relief while also going through a behavior modification program, medication by itself will not fix a dog’s anxiety or stress problem. But what if there was a more natural way to ease your dog’s stress level while going through behavior modification, one that didn’t involve harmful side effects or harsh synthetic chemicals but still had amazing results? Well, there is! It’s called AROMATHERAPY! What Is Aromatherapy and How Does It Work? I’m sure you’ve heard that term before, but first let me clear up a common misconception about the use of “aromatherapy.” With so many mass-produced, scented products available in stores, it’s easy for someone to think that any scented candle, room spray or body lotion is considered aromatherapy. WRONG. Most of these scented toiletries and home products are made with synthetic fragrances and are rampant with toxins like benzene (which has been identified as a cancer-causing agent), toluene (which effects the central nervous system and can cause headaches and drowsiness), and parabens (added preservatives that affect the endocrine system/are hormone disrupters) to name a few. While these products may smell nice to some people, they actually have no real therapeutic value whatsoever. True “aromatherapy” is the name given by French chemist Rene Maurice Gattefosse to “the art and science of utilizing naturally extracted aromatic essences to balance, harmonize and promote the health of body, mind and spirit” in the 1920’s. Perhaps the most well-known form of aromatherapy, and the one I’d like to share with you today, is through the use of essential oils. There’s a lot to know about essential oils so I will just give you the quick version. ​Essential oils are derived from a plant’s flowers, seeds, roots, bark or fruit, usually through a steam distillation, carbon dioxide extraction or solvent extraction process. These highly aromatic and volatile substances are extremely concentrated and, contrary to what their name suggests, true essential oils are not oily or greasy at all. Not every plant produces essential oil, but the ones that do are linked to a variety of physical and emotional health benefits. Holistic medical professionals and veterinarians have been using essential oils for decades as solutions to ailments ranging from anxiety and arthritis to skin irritations and immune system weakness. In fact, it is not uncommon for French veterinarians to prescribe a course of essential oil treatment to patients rather than prescribing medication. Long before technology allowed us to make synthetic medications, we used plants and items from nature to heal us and sustain our emotional balance (and many third-world countries and cultures still use them today). Essential oils work with the body on a biological level. Because dogs have a similar physiological makeup to humans, early essential oil research was actually tested on dogs before it was performed on humans anyway! Essential oils are sensitive to temperature and light (particularly those from the citrus family), so they should be stored in amber or blue glass bottles (not clear or plastic) and at room temperature out of the sunlight (or even refrigerated to prevent oxidation). But Are Essential Oils Really Safe for Dogs? There has been a lot of confusion about the subject of essential oil use in the dog world. That is often because of a misunderstanding of how essential oils are used and administered, which ones are most beneficial for dogs (and which ones should be avoided), and where to find top quality essential oils that are not adulterated with synthetic substances that can pose a toxicity risk. ​Because essential oils are so concentrated, they should be diluted before use with dogs (whose noses are much more sensitive than our own and whose bodies are smaller and process substances differently). Blends should be formulated properly in the right ratios so as not to be overbearing. Essential oils do not mix with water so are often diluted in a high-quality base oil, such as jojoba, sweet almond, fractionated coconut, or sunflower oil. The best quality essential oils that are 100% therapeutic grade are usually available only through a supplier in small batches. It takes a LOT of flower power to make just a few drops of essential oil (for example, it is estimated that approximately 150 pounds of lavender produces just 1 pound of lavender essential oil!) so companies whose products are made in mass production and carried in supermarkets or even health food stores have a much higher chance of being adulterated and not pure – lessening their cost but also lessening their therapeutic value and safety for your dog. Just because something comes from nature and is “natural” doesn’t mean it is safe for our use or for use with our dogs. For example, cocaine comes from a plant! Just as so, there are some essential oils that can be irritating to humans but especially to dogs, particularly those with high phenol or ketone content. Clove, oregano, pennyroyal, tansy, thyme, wintergreen, yarrow and melaleuca (tea tree), to name a few, are all essential oils that should be avoided with our canine companions. It is also recommended that you consult with a veterinary professional before using essential oils with cats, as their body systems work differently that those of humans and dogs. Cats’ livers lack the necessary enzymes to metabolize certain substances and excrete them, so foreign substances can easily build up in their bodies, posing a higher toxicity risk, if they are over-administered (dosage levels too high) or administered in the wrong way. How Can Using Essential Oils With Dogs Decrease Stress and Tension? When used with behavior modification techniques and some other natural healing remedies like massage and herbal supplementation, the use of certain essential oils can soothe the central nervous system and help your dog regulate their emotional state more effectively. There are several essential oils that are safe for dogs which have natural calming and grounding effects. Lavender and Roman chamomile are perhaps the most well-known for relaxation. Others include marjoram, sweet orange, vetiver, valerian, spikenard, ylang ylang and petitgrain. Since some of these essential oils don’t smell as sweet on their own, making a blend with other essential oils (in the right ratios) can temper the scent and make them more appealing. You do want to make sure your dog is actually going to enjoy using the essential oils by introducing them in the appropriate way. Remember, essential oils are highly aromatic so a few drops are all you need! You can also use treats to help your dog make a good association to the oils if he’s food motivated or enjoys massage (see below). ​*If your dog is showing any adverse signals however, such as strong avoidance, repeated sneezing or frantically rubbing his body on the ground (as if to rub the scent off), discontinue use of the essential oils – this can indicate that your dog does not like the essential oils you have selected or may even be having an allergic reaction to them. Diffusing: Using a diffuser, which will ultrasonically disperse the essential oil molecules into the air for your dog (and you!) to breathe in, is a less direct way of using the essential oils but is preferred by some people (and dogs too – my Scout isn’t a big fan of me putting the essential oils on him but will hang out near the diffuser and fall asleep). Doing this may not only make your house smell nice but it can also help relax you and your other family members as well as your dog. Since dogs tend to mirror the emotional states of their people by reading their energy and body language, helping yourself de-stress can certainly have a strong impact on your dog. Just add a few drops of the pure essential oil to your diffuser and let the magic surround you! A good rule of thumb is to start with 2-3 drops then work your way up to 4-6 drops for every 100mL of water. Topically through massage: As long as your dog doesn’t get fearful or aggressive with touch, and especially if your dog really loves being rubbed by you, this can be a great way to enhance your bond. Massage in itself can relax a dog, so then the combination of the essential oils and the massage can really put your dog in a calmer emotional state. Plus, this kind of touch releases oxytocin in our brains – which makes both you and your dog feel good and foster feelings of love and trust. When putting essential oils on the skin, they should be diluted properly in a base oil (and perhaps in a rollerball vial for easy access). Just roll 3-4 drops on your finger (maybe only 2 for a small dog), rub your fingers together, and then gently massage behind your dog’s ears. Avoid direct contact with highly sensitive areas like the nose, eyes and mouth. Where Can You Find High-Quality Essential Oils for Your Dog? As mentioned earlier, true high-quality essential oils are available only through a private supplier rather than at a store. I highly recommend doTERRA essential oils. Their oils are organically sourced and are Certified Pure Therapeutic Grade. They use third party specialists to perform hundreds of quality control tests on every batch before bottling to ensure they are free of harmful contaminates, pesticides and synthetics. You can find out more about this quality company at https://www.doterra.com/US/en. I am actually registered with DoTERRA as a Wellness Advocate and can sign you up to get DoTERRA oils at wholesale pricing - ask me how. "Good morning Maria! Just wanted to let you know the essential oils are working fabulously! Pepper tries to lick my fingers when I have the oils on there after I rub behind her ears haha!!! I have definitely noticed that Molly and Pepper are more relaxed over all! This is great! Thank you!!!" ​And schnauzer Sophie used to have severe separation anxiety, even though she had her sister Elsie with her. Sophie would pant uncontrollably and cry, and her owners would come home to a crate full of drool. But not when using my "RELAX" blend of essential oils in a diffuser in her room! 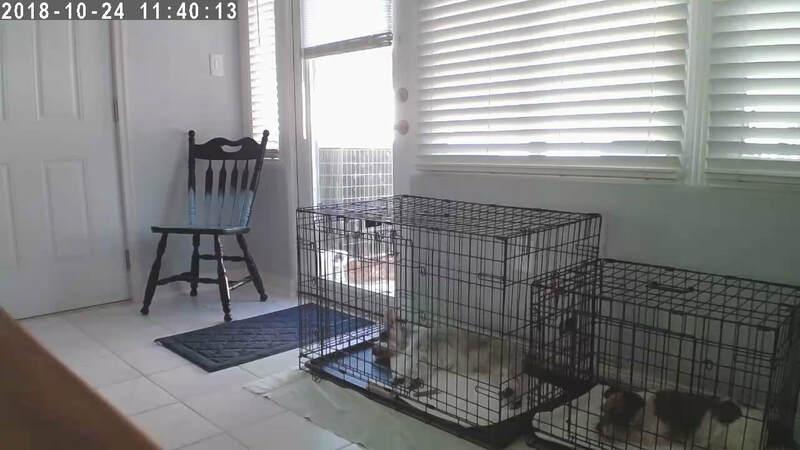 This photo is from her pet-cam - the snoozing gray angel in the larger crate is Sophie, she's fast asleep! No medication needed. These essential oils help soothe Sophie in a completely natural way, and can do the same for your dog! ​The healing benefits of essential oils are plenty, but especially when it comes to your dog’s stress level they can have wonderful results to “take it down a notch.” Your dog can become more comfortable, less high-strung and reactive, and settle more easily. Fights between dogs in a household can cease. A relaxed dog is a happy dog, after all!